One of the benefits of having a table tennis table in my garage, is that I get to practise my serves a lot. I spend time practising my favourite serves – the ones I always use in matches. I also spend some time experimenting with different service actions and spin. As a result of all this practice, my service game is quite strong. I usually win lots of points on my serve and my service tactics get me out of trouble when other parts of my game aren’t working quite so well. In this blog post I share some of the service tactics which help me win cheap points. First, a warning! Some of these serves will work brilliantly against one opponent, but may be totally ineffective against another opponent. Your job is to find out which serves work against which opponent, and which serves do not. You also need to remember that it’s not all about trying to win the point directly from the serve (although this is a bonus). It’s just as much about getting your opponent to return the ball in a predictable way so you can take control of the rally. The purpose of this serve is to target your opponent’s crossover point, i.e. his right hip if he are a right handed player. This is the small area where where your opponent has to make a decision whether to play backhand or forehand. If you serve at speed, your opponent has less time to make this decision and move his feet. The result? If the player doesn’t move, he has no space to play a stroke and will often make an error or make a weak return for you to attack. The crossover point is quite a small target area. If your serve drifts too much to the centre of the body, your opponent will be able to return with his backhand. If the ball doesn’t turn enough, your opponent will be able to return with his forehand. You have to try and find the small space in between his forehand and backhand, e.g. his hip. Keep hitting this target and you will win lots of points. This is a good serve to use if an opponent’s footwork is poor. The aim is to serve very wide, so the ball keeps moving off the side of the table. 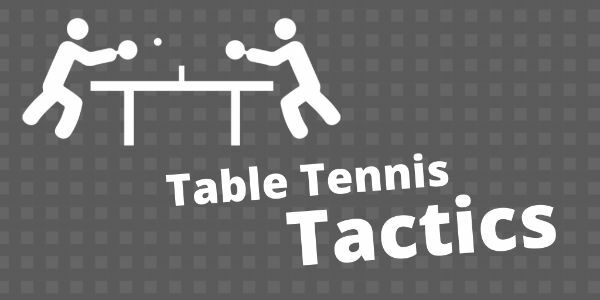 This will move your opponent out wide to his backhand side, leaving the table wide open for an easy third ball attack. If your opponent doesn’t move well, he may never reach the serve. You’ll ace him. If his does get to it, 90% of the time he will be so surprised he will just return the ball where it came from. So just stay in the backhand corner and play a quick forehand or backhand to the open side of the table. A lot of coaches will tell you not to serve long backspin, as it’s too risky. You give your opponent an opportunity to attack. This is very true if you are playing at a very high level. But at local league level, especially in lower divisions, players struggle to attack these serves. They don’t have good enough topspin attacks. Rather than attack, a lot of players will just push the ball back. If they push rather than topspin, you can use this serve to set up a very predictable return. Because the serve is long, the push return will come deep, which will give you a very good opportunity to topspin the 3rd ball. If you want to set up your backhand attack, serve crosscourt. If you want to set up a forehand attack, serve more to the middle or forehand side. Topspin serves are often underrated and underused. I think this is because they are not particularly difficult to return and if a player has a strong attack, he may wallop the ball past you. However, the real advantage of the topspin serve is that the return is very predictable. You serve topspin, 95% of the time your opponent will return with topspin. The key is to target your opponent’s weaker side, if he has one. If a player has a weak backhand, a long topspin serve should cause him all kinds of problems. He may passively prod at the ball, causing it to pop up a little high and you then have a great opportunity to attack the third ball. Even if he returns the serve a bit more confidently – no problem – it will just be topspin and you will be ready and waiting to attack anyway. Players rarely serve with their backhand from the forehand corner. It doesn’t make that much sense, as you take your forehand out of the game and you leave your own backhand corner very exposed. However, if you have a strong backhand attack, this serve can really work for you. The serve itself can cause loads of problems, as the sidespin cuts right across an opponent’s forehand, much like a lefty serving to a righty. Players just aren’t used to serves coming from this angle. If they’re not used to it, they will make plenty of mistakes. If the ball is returned, it is usually returned crosscourt, straight into the server’s backhand attacking zone. Then boom! Point over. I’ll finish with something fun to try. I often noticed that when my serve went horribly wrong and bounced up high, my opponent would be so surprised he would completely mess up the return of serve. I would apologise for doing such a rubbish serve and winning the point, and my opponent would just look embarrassed. Then I started doing it a bit more on purpose (usually when I had a comfortable lead). I’d throw in an occasional bouncy backspin serve and watch in amazement as the change in trajectory and speed would completely panic an opponent. I have found that bouncy backspin works best, because players underestimate how much backspin is on the ball and they don’t topspin it enough to lift it over the net. This won’t work against everyone. A stronger player may blast the ball past you, making you look a bit silly. But it’s something worth experimenting with. Now that I have shared some of my service secrets to win cheap points, why don’t you do the same? Let me know in the comments box below which serves you use to win cheap points against your opponents. i find a flat fast serve to the crossover point is good too. Yes! This can be very effective. Players often try and block these serves, but because there is not much spin on the serve, the ball tends to go in to the net. i like to do a backhand serve fast and long to the crossover point . Its the best as it confuses them and they return it weakly.